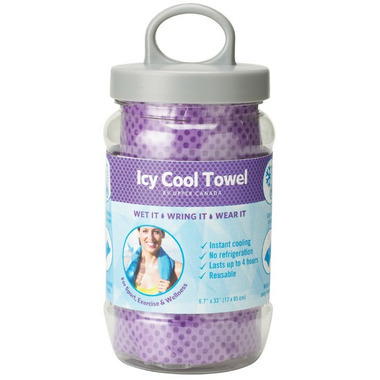 Upper Canada Icy Cool Towel is an innovative towel that delivers instant, long-lasting coolness; wherever, whenever. The unique, lightweight fabric retains coolness for up to 4 hours with no refrigeration required! Perfect for sport, exercise, health & wellness. What kind of workout warrior are you? From runners to yogis, find your workout must-haves with these staff picks on our blog, The Well! I love this, it really helps keep me cool, which is important in the summer when you have ms. The reason I put a 4 instead of a 5 is I find it a bit long, but otherwise it's really great. Love the towel , purchased 6 for family, great for those sweaty summer days! Do you need to let it dry out before storing? Will it getting moldy, smelly if stored when wet?